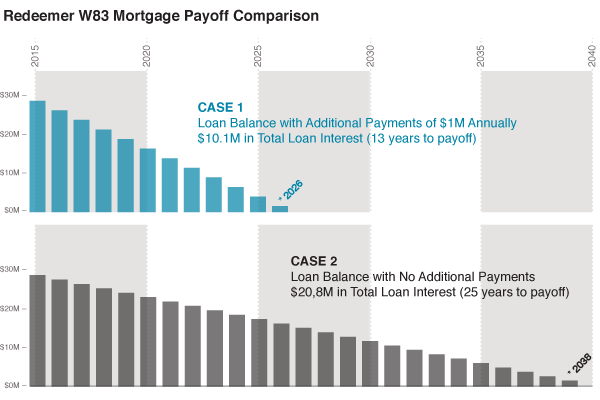 Redeemer's goal is to pay down our mortgage by $1,650,000 each year, representing $650,000 in regular principal payments and $1,000,000 in additional principal payments each year. We have exceeded our goal on an aggregate basis from 2013 to 2016. We are on track to pay off our mortgage in 13 years rather than 25 years (see below). Please consider making a gift above and beyond your regular giving to the W83 Building Fund. Your gift will be used to make an additional payment directly against the mortgage principal.